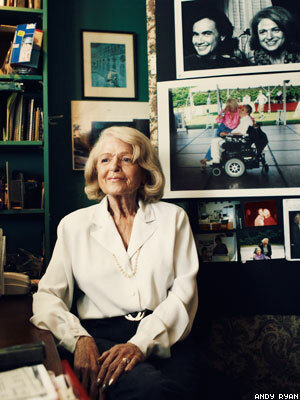 Edie Windsor met Thea Spyer in a distant New York City, before Stonewall, long before AIDS. It was 1965; the Beatles were singing 'Yesterday,' and Bewitched was in its first season. They met, and they danced, and they fell in love. They were both professional women -- Thea was a clinical psychologist with a practice in New York; Edie spent much of her life as a computer systems consultant for IBM. In 1975, Thea was diagnosed with multiple sclerosis, which advanced rapidly until she could no longer walk, though she continued practicing throughout her life. The couple married in Toronto in 2007, but Thea's death in 2009 resulted in a $350,000 penalty in federal estate taxes that would have been avoided if they were a heterosexual couple. Last November, Edie -- who was recently the subject of a documentary, Edie & Thea: A Very Long Engagement -- filed a lawsuit, with the aid of the ACLU, challenging the constitutionality of the Defense of Marriage Act, which defines marriage as a legal union between one man and one woman as husband and wife. Here she recalls her 44-year relationship. Thea was diagnosed with MS the day before my mother died. That was in 1975, and by 1980 she was using two Canadian crutches. The first time we ever danced using the wheelchair -- I would sit in her lap in the wheelchair -- the song on the radio was, 'There's a place for us, there's a time for us.' I can't even sing it because I cry. When I'm sick now -- I have a lot of angina -- that's when I miss her the most. I say to myself, 'Honey, what's become of us?' And I lean against the full-length picture that I have of her. But she had this angina increasingly, and the doctor had said, 'If you can last for two more years, they're very close to having this noninvasive blah, blah, blah,' but it was clear that she wasn't going to survive open-heart surgery to get to the valve. And she said, 'We only have two years at best that they could give me.' And one of those years would be lying in a hospital, and she just said, 'No. I want the summer.' She said, 'I'm not coming to the hospital.' I made her get on the phone so the doctor would know, and asked if there was anything else we could do, and he said, 'Nothing -- give her a little morphine.' And she elected it. That's one of the greatest things, the part of the picture that's most meaningful to me, where she's sitting there saying, 'I had my summer.' And that was her last summer.